Jil Sander is a German brand established in 1975. It's appeal are the pure lines and general minimalist aesthetics. What is interesting - this brand was started around 1980-ties, when the fashion celebrated glamour, glitters and colors. In the beginning the times were tough for the Jil Sander brand, however the 90-ties fashion trends changed everything and made this company one of the world known fashion labels. Jil Sander later sold her company to Italian fashion brand Prada and resigned, however today she continues designing herself for the Japanese brand of Uniqlo. Jil Sander minimalism approach is characteristic also for the handbags line. They are simple and elegant bags for men and women. Nice choice of classic leathers or nylon materials, comfortable designs, and elegant shapes. Man bags by Jil Sander are simple and spacious. These men's handbags are large and can be used as a travel bags or gym bags. The large travel bag has three compartments and you can fit a laptop there as well in a special compartment. 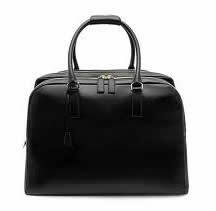 The Jil Sander weekender bag is a versatile men's bag and can be used for number of occasions. All of the Jil Sander bags for men have classic colors, such as brown, black and gray. There are also square shaped black leather handbags that can be used as briefcases or business bags. Also these leather bags for men have the elegance and they are quite practical and easy to use.